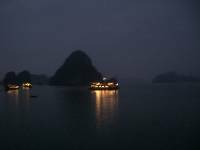 Blog from Ha Long, Vietnam | Sam and Leos adventure in Asia..
Well.. the last 3 days have been an interesting experience to say the least.. for those of you who would rather not hear tales of the drunk and naked then i suggest here is a good time to stop reading... yes mum that should probably apply to you but no doubt you will read on anyway! 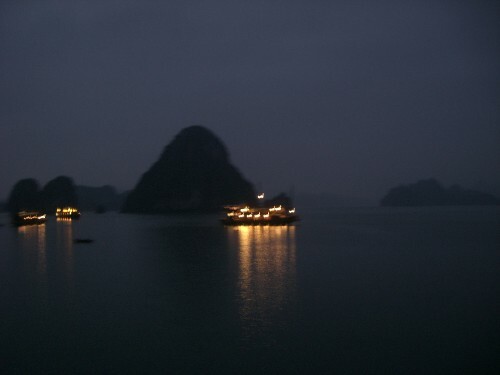 The last 3 days have been spent on a boat in Halong bay in northern Vietnam- the bay is so beautiful with loads of little islands (a lucky one of you will get a postcard of it - that is if i get round to writing and posting them..) We set out about 8am to drive from Hanoi to Halong bay after being handed a large sombrero hat each (which we all assumed was for sun protection- how wrong we were!) we then jumped straight on a big wooden boat (there were about 50 of us) had lunch, chilled out, went swimming (the sea water is like a bath in the bays so is not exactly refreshing) and went for a kayak to watched the sun set.. then the mess started with the drinking and dinner- most of us participated in a crazy 2 team ring of fire competition.. the competition somehow degraded into not only making the other team drink a stupid amout but also participating in many embarrassing activities.. it then became clear the use for the hats- it turns out when they are the only item of clothing you are allowed to be wearing a sombrero can be very strategically placed!! Many of the photos taken of activities on that night will not be making it onto facebook as I have a feeling it may result in account closure- and I am not sure I want to be reminded of some of the things that happened anyway! The following morning we were all dragged out of bed at about 7am feeling rather special! We then headed to 'the island' where we spent the second night.. we went wakeboarding and banana boating (i am still hurting from that dam banana boat!!!) and just enjoyed the sun and sea.. The second night was slightly less messy than the first although skinny dipping did occur (the hats were left on shore- well i guess it would have been rude not to in the circumstances) and there was the most incradible bioluminescent plankton in the sea!! when you moved your hands around in the water they all lit up and sparkled- it was like sprinkling sparkly fairy dust everywhere- i did not know that sort of thing even existed and it was just mental swimming along in the sea with this sparkly glow around you!! The final day was mainly recovery as everyone enjoyed the boat and sea before we headed back to Hanoi. I think tomorrow we are going to go to Sapa if we can get there for a sensible price before we start the trip south.